Cadbury Eclairs take you on a delicious journey through a layer of chewy caramel to a heart of rich Cadbury chocolate. 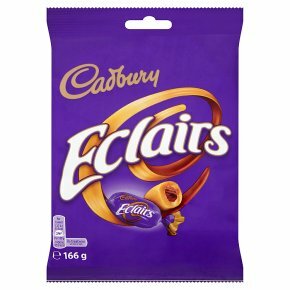 The delicious combination of caramel and chocolate has made Cadbury Eclairs a long time favourite. This generous 166g bag is perfect for sharing with friends and family. Suitable for vegetarians.